A report of the Swedish national network shows the inauguration of the evse taken place a few days ago in one of the town most central squares. 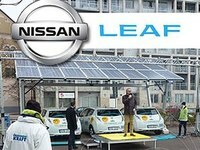 The 100% electric car is a reality now and it is named Nissan Leaf. The Japanese ecological saloon, already available in the international market, resets not only its carbon emissions, but thanks to a global approach reduces the environmental impact of its entire production process. A further proof of its “green” features is the fact that has been manufactured with 95% recycled materials. A unique cutting-edge concept supported by an elegant “eco-effective” infrastructure to charge cars with 100% renewable energies. 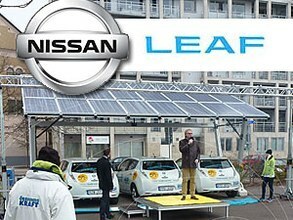 NISSAN has inaugurated in Sweden, a country always at forefront with regard to environmental protection, a "car-sharing" to hire its vehicles and to encourage no environmental impact mobility. 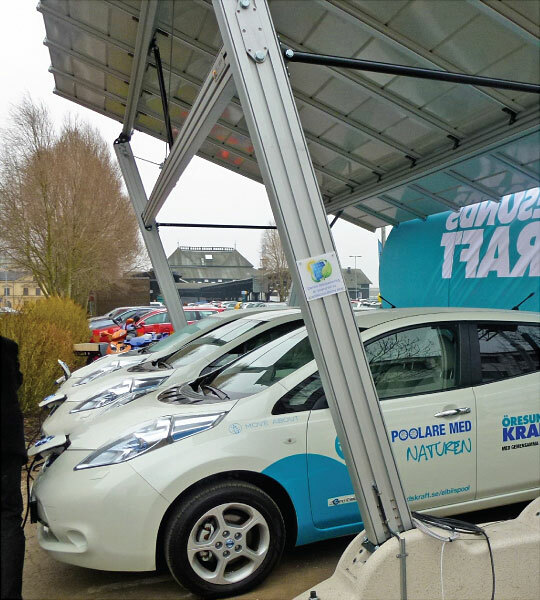 To welcome NISSAN Leaf cars there was the solar carport Energy Parking by Giulio Barbieri, designed to charge the electric vehicles. It is the only structure worldwide completely made out of aluminum, that can be placed everywhere with no installation constraints, thanks to concrete loads. Television and local media have given wide coverage to this piece of news and our ev charging carport has been immortalised in one of the most popular squares in Helsinborg.